During my childhood, our family moved several times and what I remember most about moving into a new neighborhood was the feeling of being welcomed. My mom would be invited to organized coffees in the living rooms of other women on the street, kids would show up in our yard during the first few days to find out if there was anyone around their age to play with, families brought homemade muffins/cookies/meals to the front door as a way of saying you're one of us now. Somewhere along the line the tradition of welcoming people into their neighborhood, or even connecting at all with neighbors has been grossly diminished. In my adult life I have lived in a dozen different neighborhoods and while some were more social than others, none have been to the level I remember so fondly during my childhood. Yes, times change...but what are we missing out on when we don't take the time or channel our energy into getting to know those living and breathing around us? I'm not looking to place blame because I know there have been times when I've been just as guilty of being "too busy" to make an effort with my own neighbors. Like, literally, what's happened to simple, human connection? I know I can't be the only person who experiences neighbors who drive directly into their garage and close the garage door before even turning off their ignition. Or making eye contact and waving to someone I know lives around the corner from me only to be met with their shifted gaze. Life gets busy at times for all of us, but is this a reasonable excuse for losing the sense of community in our neighborhoods? Do we only reach out to those around us when we are in an emergency situation (and do we even do that anymore)? Does it take some kind of tragedy for us to meet one another on the sidewalk or to spend time in face-to-face conversation? It's easy to place blame on fenced in backyards, busy schedules, minor tiffs about parking in front of the mailbox that leads to uncomfortable tension and then silence...but are those reasonable and acceptable excuses? I recently read a book entitled The Turquoise Table which is, in essence, about making a decision to be simply present to the people around us. Yes, in our neighborhoods...but in the grand scheme of life the message is about being present to others no matter where you are. As parents whose kids are growing up in the digital age, we cannot complain about their spending too much time looking down at a screen if we are too busy to actively engage with them. We cannot anxiously complain to other parents our fear about kid's lack of social skills if we don't SHOW THEM what it looks like to connect with those around us, right?! After reading Kristin Schell's beautiful book I decided the ministry of presence, both in my neighborhood and wherever I go, will begin with me. With the help of a friend and my husband's handiwork, within two weeks of finishing the book we had a turquoise table in our front yard. 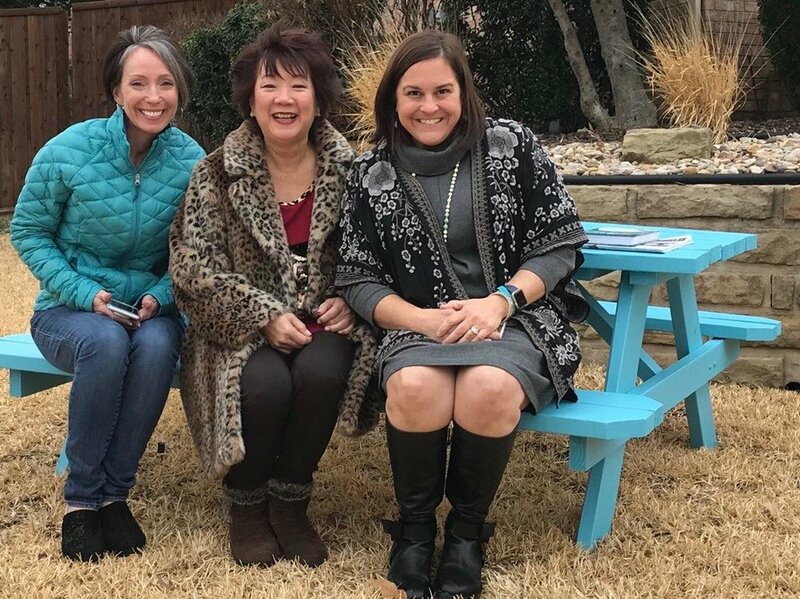 So enamored with the idea of being an instrument of presence and a conduit for closer connection within our neighborhoods and community, I recently wrote about The Turquoise Table for our local newspaper. Little did I know that my article would reach the eyes of the author herself! This prompted her to reach out to me and I was able to connect with her at my table over the weekend! 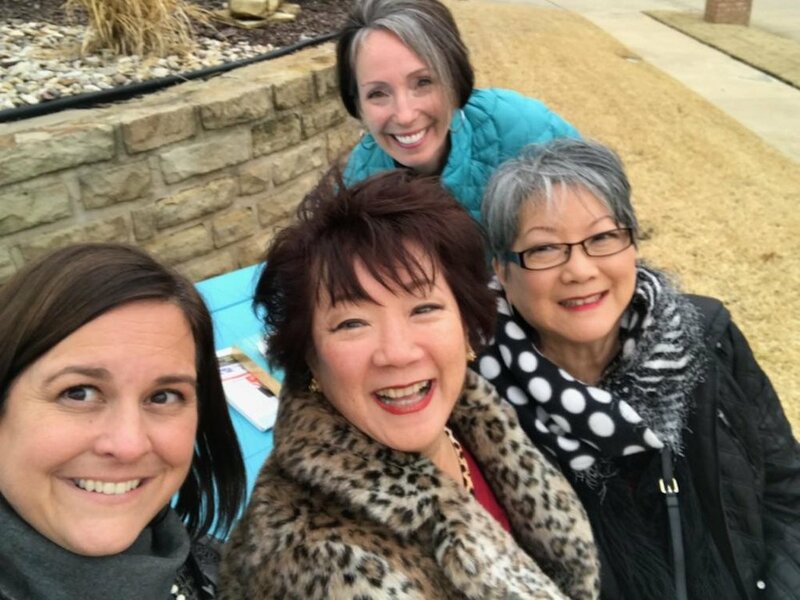 Our turquoise table is the second in our development so it was a perfect way for me to also meet my neighbor Kathy who feels exactly as I do about building community back into neighborhoods! Last week, right after the table was put in our front yard, I placed flyers in the mailboxes near our home explaining the meaning behind the new (bright-colored) table, along with an invitation to come out and join our family for cocoa and cookies. I did not look ahead to the weather...but I'm excited to say that despite the wind and cold temperatures, yesterday afternoon we had five families represented at the table! Folks young and old were connecting over cocoa, kids were running around playing tag...it was BEAUTIFUL. And because I want to connect with my neighbors, but I don't want another job or item to put on my to-do list by feeling compelled to continue to create "events," I intend to spend time just sitting at the table. Or, if you live nearby, you might see me reading a book, or come upon our family having dinner...or Tom and I sharing conversation over a glass of wine. The things that go on in our back yard can also be done out front so we can converse and welcome others who are passing by! I want this table to represent coming together, even if our family isn't outside...everyone belongs at the turquoise table. Present, not perfect. Vulnerable and open to just BEing instead of DOing. This is the gift of the table! We live a world that has no shortage of examples where disconnection reigns, but each of us has the choice and ability to create a more connected world...one block at a time! Do you have a suggestion for something that has worked to better connect your neighborhood? I'd love to hear about it! Comment below or send me an email at realifeparentguide@gmail.com.